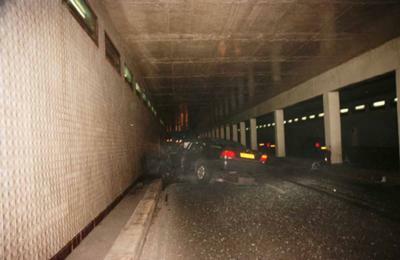 Was looking at car crash photos and came accross this one if you look closer at the image on the left against the wall I can make out what looks like a face, please can you give your feedback. If you look closely at the front door of the car you can see a woman in a white robe with fluffy ends on the next side. Looks like she is trying to get inside the car. Wow. Hello. I'm new here. I'd like to say that I also see a ghostly figure on the right side of the picture near the first column. Look closely it's a bit like a woman in a white robe. I see three in different spots. Awesomeness. Oh! I think I see the face against the wall. Really large, right? I could see a face on the wall. I could see something here as well lookin' like a man standing. But I don't know what you are referring to. Brenda I see more than one face. I see several, as if lined up. I'm not seeing it, Brenda. Can you post an outlined version to clarify?